Ohio EPA has assigned a “warm water habitat use designation” for each of the streams in the East Fork watershed that the agency has assessed, with the exception of the mainstream of the East Fork, which has received an “exceptional warm water habitat” use designation. In other words, each of the streams is capable of supporting a healthy and diverse biological community consisting of fish and macroinvertebrate species found in warm water streams. While chemical criteria have been established to protect aquatic life, these do not provide a direct measurement of the well-being of the biological community. In many cases, chemical criteria can be exceeded and the stream biology may be quite healthy. Likewise, the stream can be meeting all chemical criteria, but still show biological impairment. Ohio EPA has established biotic indices for both fish and macroinvertebrates as a means to directly assess any impacts on these populations. The Index of Biotic Integrity, or IBI, is a numerical index that characterizes the condition of the fish community and is based on a set of metrics that measure different components of the fish population. Likewise, the Invertebrate Community Index, or ICI, is based on a separate set of metrics that characterizes the stream’s macroinvertebrate community. 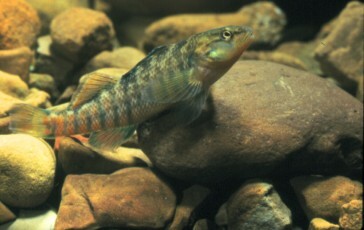 OEQ periodically conducts biological surveys at 10 to 15 stream sites. Using various sampling techniques, field crews collect, count and identify fish and macroinvertebrate species at each site, and calculate IBI and ICI scores for each survey. These scores are then compared against Ohio EPA criteria to determine if the streams are meeting their designated use. Additionally, OEQ assesses the stream habitat at each survey site using protocol established by Ohio EPA. A “Qualitative Habitat Evaluation Index,” or QHEI, is calculated for each site and compared to the IBI and ICI scores. Poor habitat can be a primary reason for low biological scores.